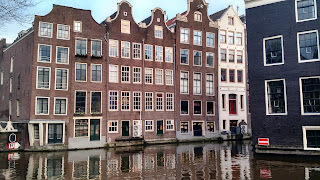 I just returned from the Netherlands. 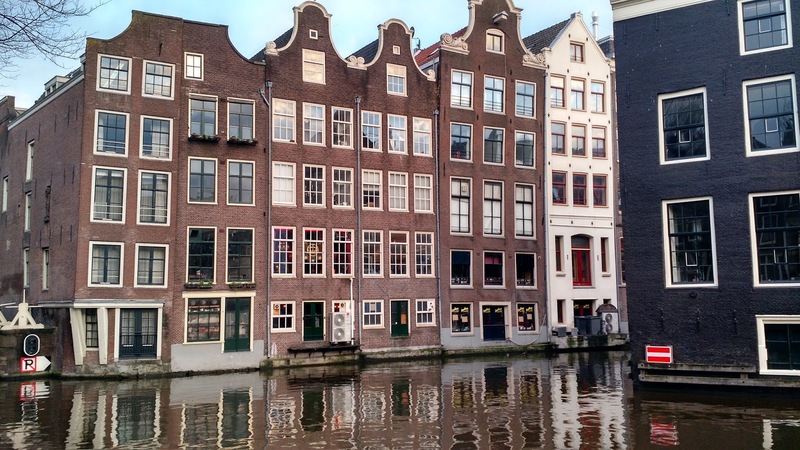 After many business trips to Amsterdam - finally a vacation trip and opportunities to see the country! I'm not counting Day 1 - from the US we landed in the afternoon of the following day - with the time change. Enough time to settle into our first hotel. Hotel one was at the airport for some initial meetings. We checked out the train schedules and enjoyed local food before bed. We always like to try local foods. These are bitterballs. A recipe and detailed description is available HERE. Great with a local beer, these were served with mustard dip. My my friend J and her husband drove in from Brussels, Belgium. We met at Central Station and took a walk around the canal ring. 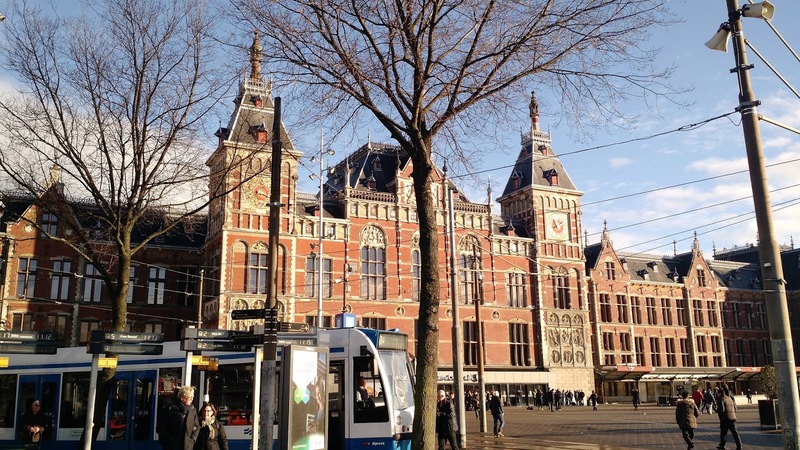 I love this photo with the tram in front of the station. 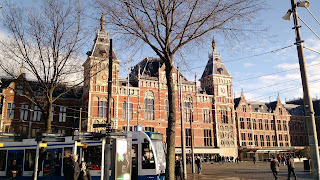 The trains and trams were easy to use. Of course one of our planned destinations was Den Haan Wagemakers. I had not been there since 'the boys' sold it to Petra and Nels. The walk was enjoyable as we discussed our fabric needs! J needed a particular red, and sure enough she found the perfect choice. I bought a bit of fabric. I am happy to report it is all available now in the US. Aren't we lucky? After my visit to Virginia last year, and power shopping at Web Fabrics I feel well stocked and very inspired. J gifted me with a beautiful fat quarter pack I treasure. It's the larger Dutch prints tied in a pretty Den Haan Ribbon. In the shop they use the ribbon as bookmarks. We saw many nice shops. 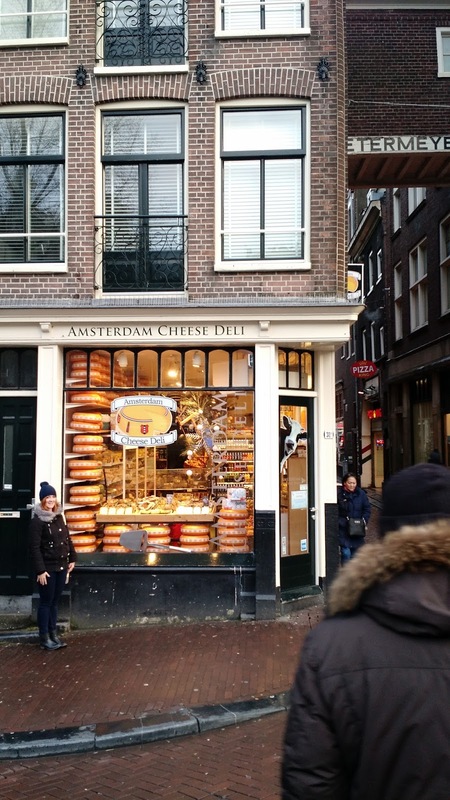 The cheese is wonderful, with specialty shops around every corner. 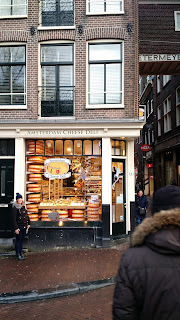 The large cheese wheels displayed in the window run about 26-27 pounds. No, we didn't bring one home, but it was tempting! We enjoyed cheese with most every meal. Gouda and Edam are very popular. 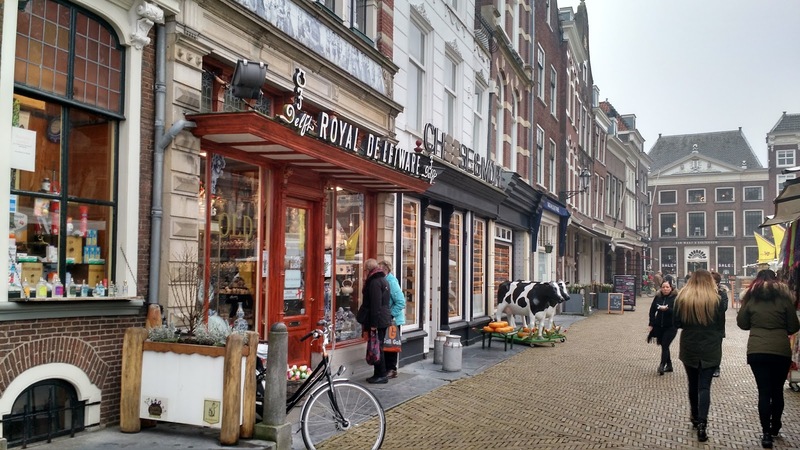 We will always check labels now for Dutch cheese. Imitations might be good, but do not taste the same. My bad photography - I do not know the people in this photo! I don't have pictures of us... J does, and I will get copies soon. 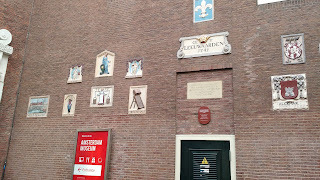 We also visited the Amsterdam Museum. The building was constructed in 1580, for use as an orphanage until 1960. The trade signs/plaques on the exterior wall are collected and saved - note the 1607 dates when you enlarge the photos. Their collections are online with high resolution images. The costumes are wonderful. HERE. After all that fresh air we retuned to the hotel for some quilt show 'n tell and dinner. It was a wonderful day! Many years over due. I met Phyllis (Oh Oh Quilts) and we visited Delft. The weather was cool, but mild. Perfect to walk around town square and along the canals. The cobble stone market square is lined with lovely shops and restaurants. 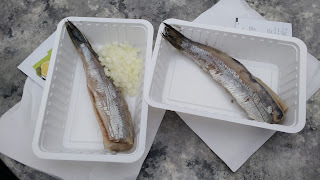 We stopped for a morning snack - raw herring. Think a Dutch version of sushi + heavy salt. 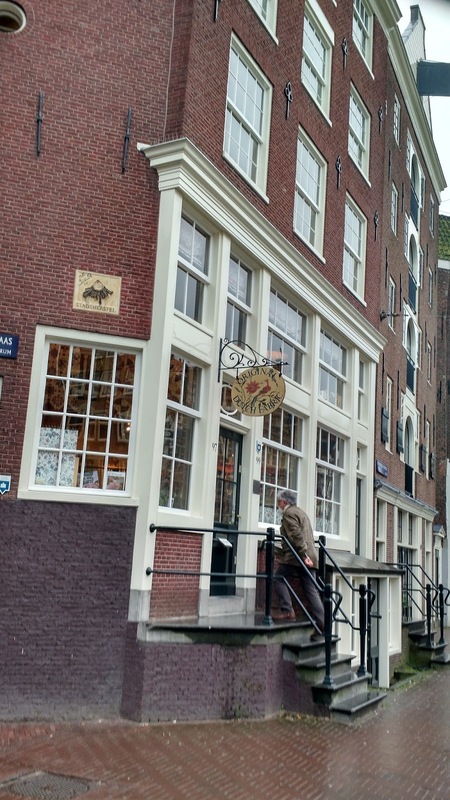 It's been a staple in Amsterdam for over 600 years. Legend has it, it is a good cure for a hangover. 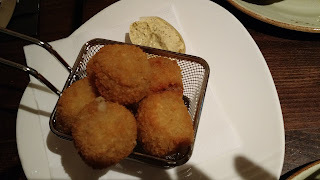 It is a fatty fish - 15% fat. The onion is optional. You hold the fish by the tail, dip it in the onion, then let it slip into your mouth. It is a little hard to hold that slippery tail. The market square has two large buildings surrounded by the shops. 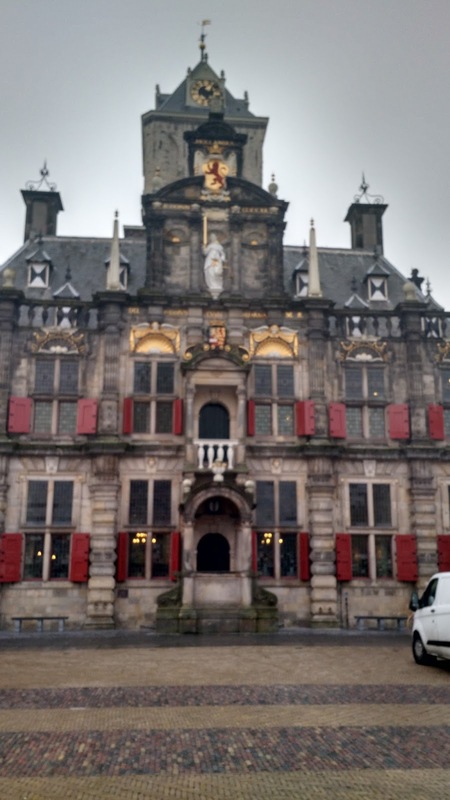 One is the church (Nieuwe Kerk), the other is the Delft Town Hall (Stadhuis Delft). 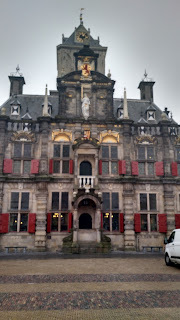 This is the 13th century restored town hall. The renaissance tower includes a torture chamber. Lunch at a small cafe off the square was a nice break in the day. We had a nice walk around the town square - it was market day with plenty to look at. 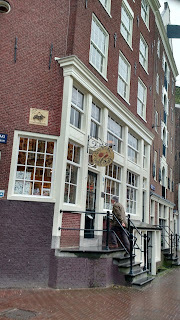 Some of the Delft workshops had artists painting the distinctive pottery. It is a white glaze base painted with a cobalt oxide that turns blue with firing. 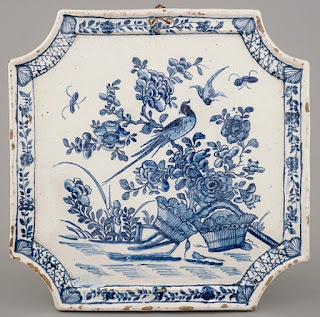 Some of the images may remind you of 18th and 19th century chintz, even the insects and birds. The pottery has been produced since the 16th century. We also had quilting show and tell in The Hague. 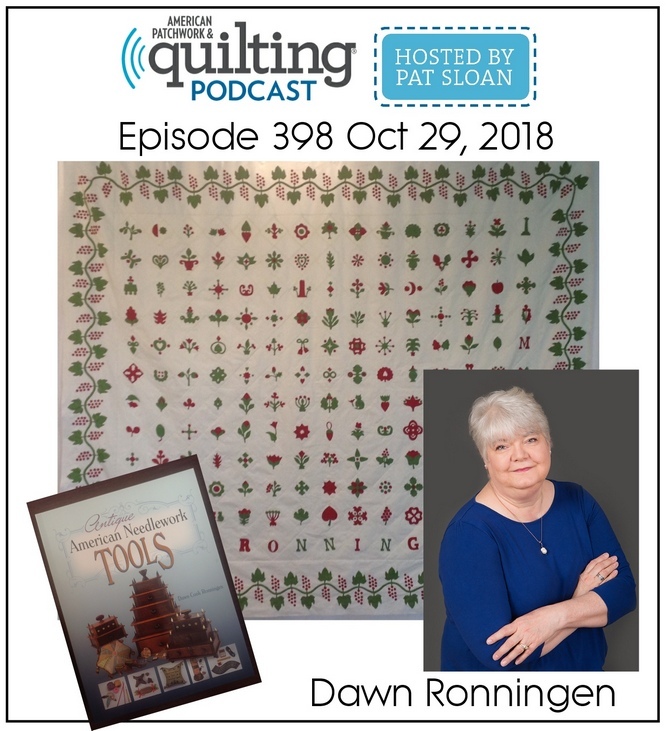 It was wonderful seeing Phyllis's studio, antique flying geese quilt and current projects. She has a large basket of rolled quilts at the ready for her family to snuggle with. Next time, let's all go together. Would you come along? I've vowed to revisit some unfinished projects this year. I pulled out this set of blocks from years ago and put them on the design wall. Working just from my fabric stash I've been auditioning for borders and sashing. Initially I was going to make a larger quilt. I have to stop thinking all of my quilts need to be bed sized! I am considering some inking on the blocks as well. I have not given up making it larger but would prefer to do so with something I already have. What about including something from my stash of panels? It is a little too white and pastel for the blocks - I will consider some tinting with heat set fabric pencils and perhaps even a dip in a coffee/tea bath. Still not sure I want to go to that extent when I do have other ideas for it in its current colors. Using it is a commitment to hand washing only - That's OK. I am also considering pulling out the fruit and elephant - keeping this all birds? Maybe revisit the lap size? I have always loved antique Dutch quilts. Over the years I have shared my completed reproduction quilts with you here. Today I am sharing them in one post. This was the first, "Hindeloopen". I purchased the kit in Houston from the Petra Prins booth many years ago. It was packaged so lovely! A big bow around the tissue. Later, the pattern was published in the book, "Treasures From Holland". Made entirely of beautiful Dutch chintz. It is machine pieced and hand quilted. The original is backed in red cotton. I didn't know that at the time and mine is backed in a Dutch print. The antique quilt is included in the book, "A History of Dutch Quilts" by An Moonen. This quilt was made from fabric charm squares gifted to me. The pattern was included in the package. 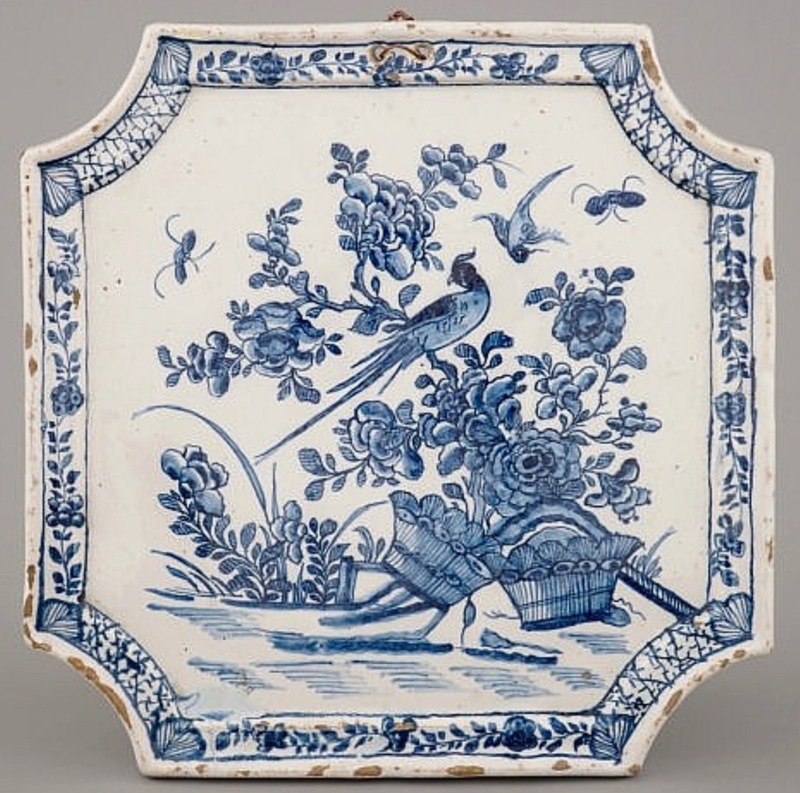 It is made from a variety of Dutch chintz prints. The solid navy is also glazed. I machine pieced and machine quilted this one. For the longest time I wasn't going to cut the charm squares. As the fabrics became more readily available in the US I ordered yardage and used the charms. The Elephant quilt is my small "loose" interpretation (from stash) of an 1800-1825 coverlet from the Netherlands Open Air Museum. There is a similar pattern in Petra & An's book, "Promenade in a Dutch Garden". I made my interpretation before the pattern book was out. 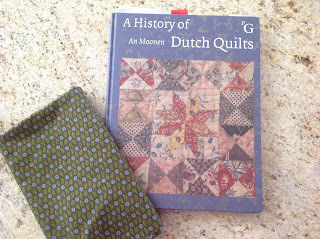 The antique is also included in An's book, "History of Dutch Quilts". The antique is backed in red, an unquilted coverlet. Mine is hand quilted and includes batting. 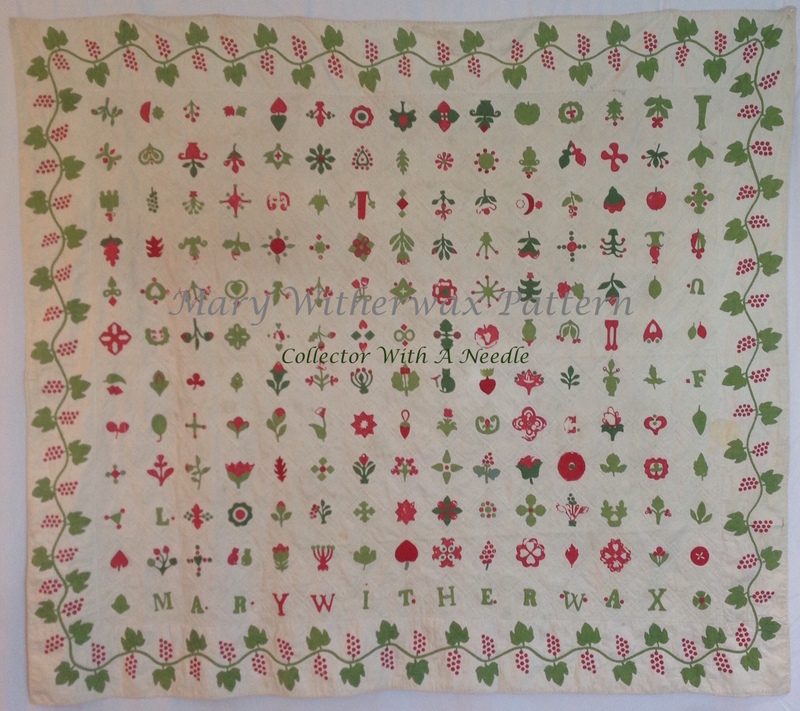 My next attempt at duplicating a Dutch antique is the back of the Gooische stars quilt. I decided to make two separate quilts, rather than one two sided quilt. I changed my border, using a reproduction print from a line licensed from The Metropolitan Museum of Art collection. 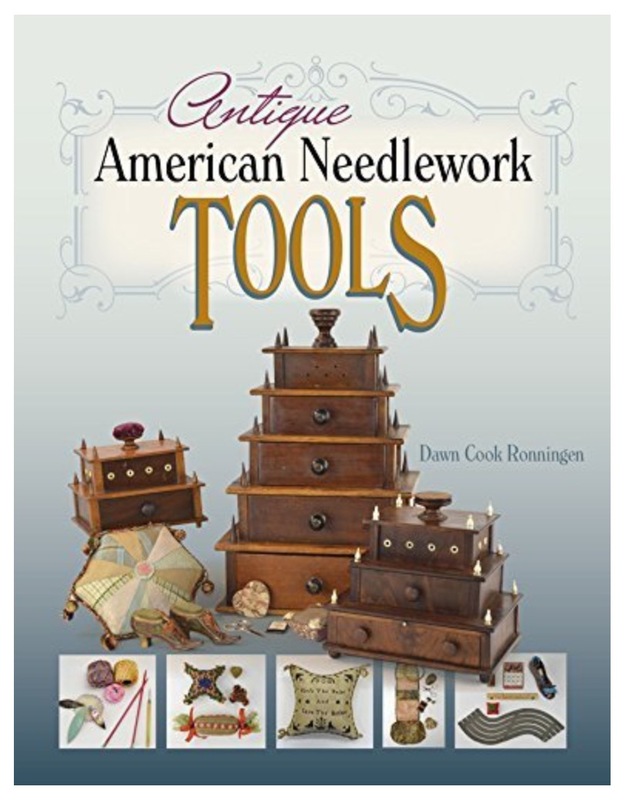 I am re-thinking the quilting plan, as I learn how many of these examples are unquilted. Maybe it is time I back one in red? The pattern can be found in Petra & An's book, "Promenade in a Dutch Garden". I never tire looking at the fabrics. The piecing was a joy, revisiting all of the beautiful fabrics. Should I start another project? These are 1/2" hexagon florets. I will add tot he variety this year, maybe get to 200 next year. The project is all planned and includes applique. These are silk hexagons, 3/4" per side. Made from silk fabrics, primarily ties. I have enough ties to make three table runners. One for me and then one for each child. Several of the silks are old ties from my husband over the last 40+ years. I was also gifted some Italian silk ties to add to the mix, variety is a good thing! I am not sure how I will set them, I will decide after more are completed. Setting silk may be a purchase. This is my New Years start....1/4 " hexagons. A friend said she was going to try them. "They are so cute" she innocently said...that was all I needed and I was all in too! Ever the optimist, I bought a package of 1,200. Yes, 1,200. These are my first three from trash scraps at the cutting table. Lots of ideas came to mind - but it is always nice to hook in some other WIP. 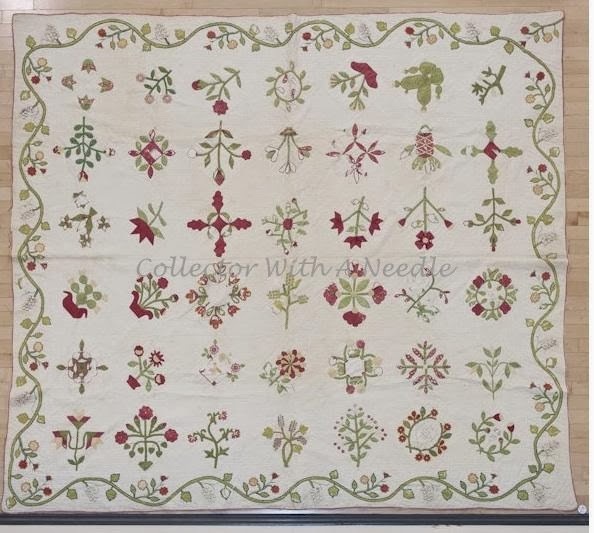 I purchased a few of the small (6") Fruit Basket Medallion panels from the Quilt & Textiles Collection HERE. This is the 6" medallion, with the 1/4" florets. I plan to trim the medallion then add a printed fabric border before I add the hexagon round. My approach to hexagons is simply paper, needle and thread. I don't starch, glue or baste through the papers. I reuse the papers. Just a little tack stitch at each corner works best for me. Do you have any hexagon projects?